to the information above and other information of interest. Plutonium 239 has a half-life of 24,110 years. Plutonium 239, since it emits on decay an alpha particle can be safely handled. Pu-239 toxicity is derived from inhalation, with an LD50 at 5ug/kg. 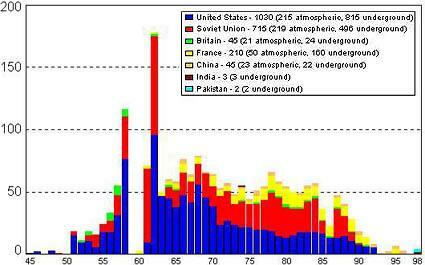 The bomb dropped on Nagasaki contained 6 kilograms of which only 1 kilogram fissioned (exploded). The 2,000 metric tons could be converted to one quarter million hydrogen bombs. For plutonium 239 becomes unstable at 20 grams per cubic centimeter. Plutonium 239 has a density of 16. United States has about 250 tons of plutonium in nuclear weapons, and another 250 purified for use. Alpha particles can heat water, thus making PU 238 & 239 suitable for use in nuclear reactors. As of now an acceptable design for breeder reactors has not been found. Pu-239 is one of 3 fissile material (the others U-235 & 233) used in the production of nuclear weapons.